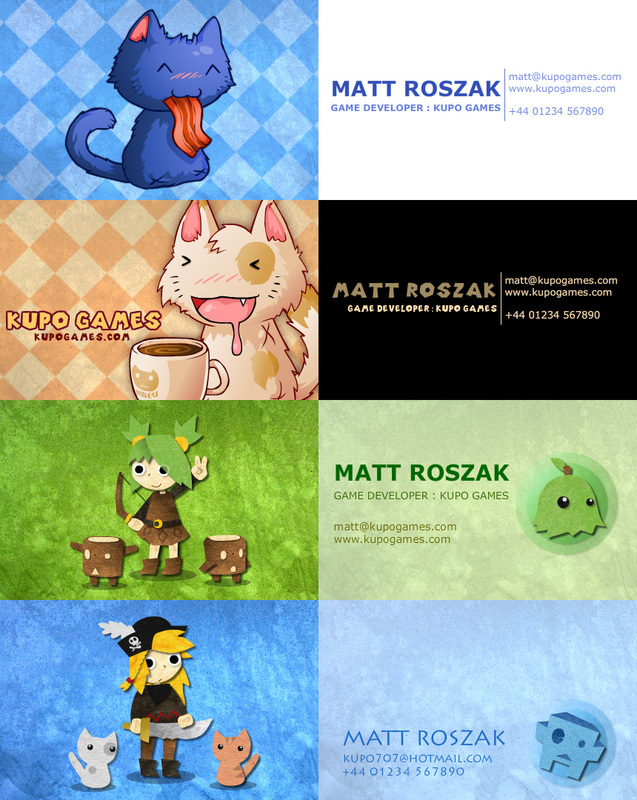 After collecting a bunch of awesome business cards in London, I decided it’s time to make my own. Here’s a few designs I came up with. I think I’ll probably go with the first one. This entry was posted in Cat Cafe, Epic Battle Fantasy 4, Misc Art on September 26, 2013 by Matt Roszak. It’s the only one with words on the Front. I’ll say that the first is best but try to combine a cool element from other ones to make the first one perfect. Yeeeah, I like what Tamoor said. All you gotta do is put shades over the blue kitty’s eyes, don’t change ANYTHING else! It’ll be perfect then! I suggest adding Matt too. A tiny bit of Matt and the rest of the gang but mostly no legs with the shades. I like the last one best. They’re all really cute, though. I think that the second one with the cat and the coffee suits you best. Do you intend to use only the classic paper-like card? I remember there was a type of card with a small section that can pop out to slot into a USB port; and some Google work can reveal producers that can make some of these for you. If a USB business card is financially viable for you, you then have additional options and design paths open to you. But that aside, I like how your second design presents your company name on both sides for easy identification. And I also like how your first design resembles NoLegs, who might seem almost like an iconic mascot to those familiar with your games.